DirectOut’s MA2CHBOX.XL is a compact desktop unit that permits any two audio channels of a coaxial or optical MADI signal to be monitored via headphones or external speakers. ANNA-LISA is a compact, handheld MADI analysis tool, allowing engineers to rapidly confirm the integrity of MADI signals of all types, and to identify any problems occurring as a result of MADI transmission. It is an essential tool for broadcast facilities, OB vehicles, touring PA systems, and product development labs. The analyser accepts MADI signals in either coaxial form via a BNC socket, or optically via a suitable SFP cartridge. An empty SFP carrier is provided, into which may be fitted any compatible optical receiver or transceiver, to suit the fibre standards in use. DirectOut will pre-install suitable DDM (Digital Diagnostics Monitoring)-capable cartridges – which enable analysis of the optical signal – on request. All MADI formats are supported – 56 or 64 channels and 48 or 96 kHz frame rates – with auto-detection. 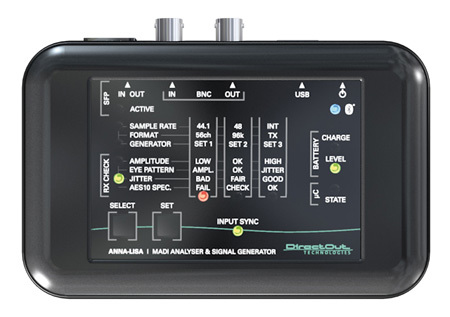 ANNA-LISA also incorporates a multi-standard MADI test signal generator, catering for all channel count/frame rate standards and 48/44.1 kHz sample rates. Three generator presets are provided for storage of different MADI signal formats and rapid generator re-configuration. The presets also define the audio test signal to be used: white noise on all channels, a 1 kHz sine wave at a different level on each channel, or four sets of 16 semitone-spaced tones at -20 dB across all 64 channels. In situations where a more quantitative analysis is required rather than a yes/no indication, an ANNA-LISA app is available for Android devices connected via Bluetooth. This provides a more detailed set of data for all the parameters being measured, plus a display of all the various control and status bits in the incoming MADI stream. Generator setup is also provided. Connection to the computer may be via the USB 2.0 port, or Bluetooth®. The USB port is also the means of updating the unit’s firmware. ANNA-LISA is powered by an internal rechargeable LiPo battery; LED indication of battery state is provided on the front panel. Recharging is via the USB port (either from the host device or a USB charger), and a further LED indicates charging progress. The unit measures only 120 x 76 x 21 mm, and is thus small and light enough to be carried in a pocket.